Video Recipe - One of the most classic sauces. Often used for fish and chicken. It ss always a hit. And as it is made ​​almost entirely of butter the consistency never fails. It can be a little tricky until you get the hang of it, but when you have learned to make it, it is one of the quickest and easiest sauces to make at all. Ready the water bath. Place an empty bowl on top of a pot of hot tapwater. The bowl need not be in the water. Steam works just as well if the bowl is tight fitting. Don't turn up the heat just yet. 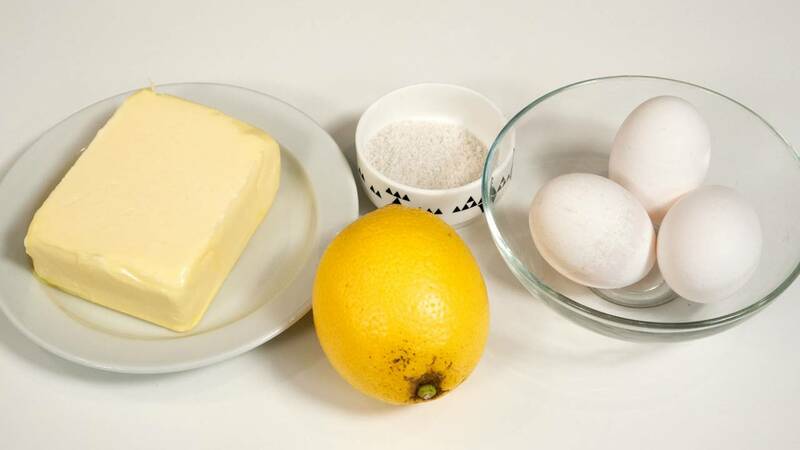 Mix the egg yolks and lemon juice in the bowl. Melt the butter in another pan. Take it off the heat and let the milk solids and water (the white goop) sink to the bottom. Turn on the pan with the water bath. 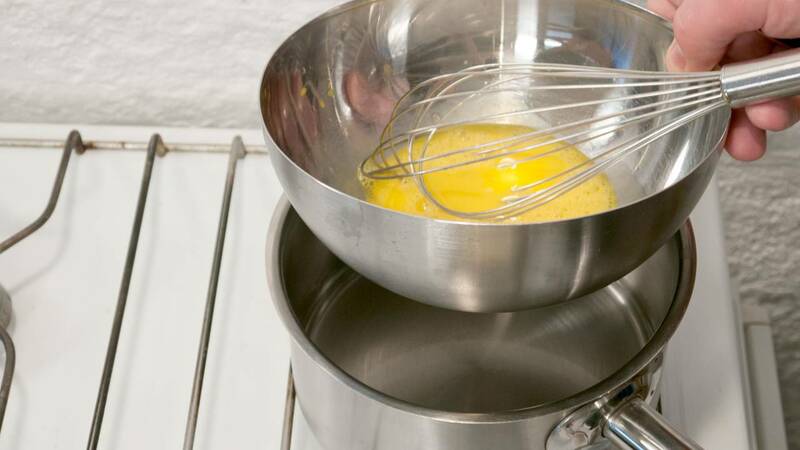 Under constant stirring, pour the melted butter in a thin stream into the egg yolks and lemon juice. Stir the sauce constantly until the sauce has the right cream-like consistency. Do not go above 70°C (158°F) as it will make the sauce curdle and separate. This the hardest thing to do right with the hollandaise! If it becomes too thick, then thin it with a little water or lemon juice. Season with salt, and pepper if you like. If the sauce gets too hot it will separate. You can save it by letting it cool slightly and then mix in a whole egg. Once you become more experienced, and have made the sauce a few times, you do not have to use a water bath. You can mix it together directly in a saucepan over low heat. 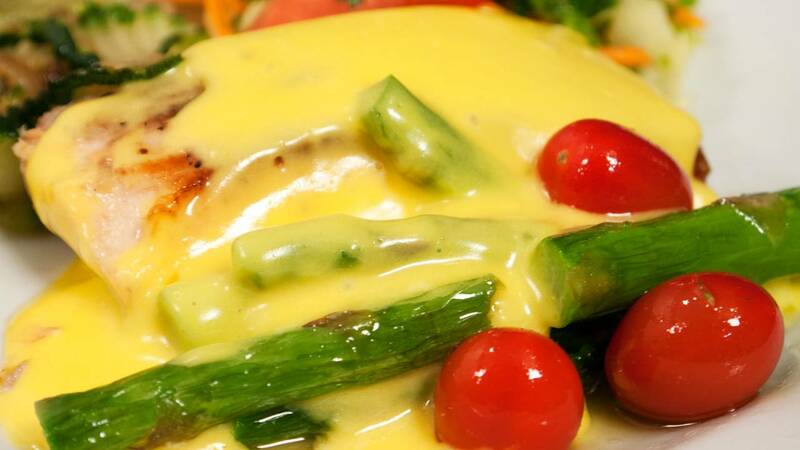 A Bearnaise sauce is pretty much the same recipe and method as a hollandaise. So when you can make the hollandaise you can also make bearnaise! I made this for the first time this morning to make Eggs Benedict for my Sweetie for our Valentine's breakfast...it turned out delicious!! Your video really made all the difference. Thanks so much for sharing your recipes, time, and knowledge. Happy Valentines Day! !